White Scale Scoop with 1 lbs. Counter Balance | U.S. Plastic Corp. The scale scoop works with most scales and allows you to quickly and easily weigh and pour product. 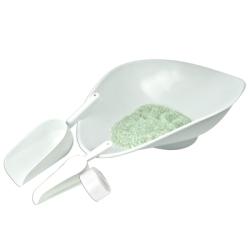 Small and medium scoops are easy to grip and feature a hang hole to keep them easily accessible.